The Sonics are an American garage rock band from Tacoma, Washington, originating from the early and mid-1960s. Among The Sonics' contemporaries were The Kingsmen, The Wailers, The Dynamics, The Regents, and Paul Revere & the Raiders. This movement is credited with founding Seattle's music scene which survives to the present. The songs that the band played were a mixture of garage rock standards ("Louie, Louie", "Have Love, Will Travel"), early rock and roll ("Jenny, Jenny", "Skinny Minnie") and original compositions such as "Strychnine", "Psycho", and "The Witch", all based upon simple chord sequences, played hard and fast. 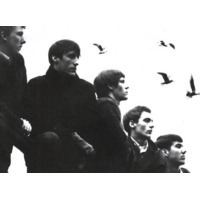 The lyrics of The Sonics' original material dealt with early '60s teenage culture: cars, guitars, surfing, and girls (in songs like "The Hustler", "Boss Hoss" and "Maintaining My Cool") alongside darker subject matter such as drinking strychnine for kicks, witches, psychopaths, and Satan (in the songs "Strychnine", "The Witch", "Psycho", and "He's Waitin'", respectively).